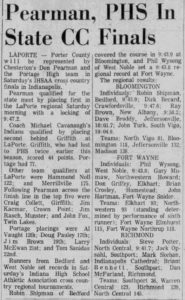 In Coach Cavanaugh’s 4th season the Indian cross country team exploded onto the state scene and was one of the dominant teams in the northern part of the state. 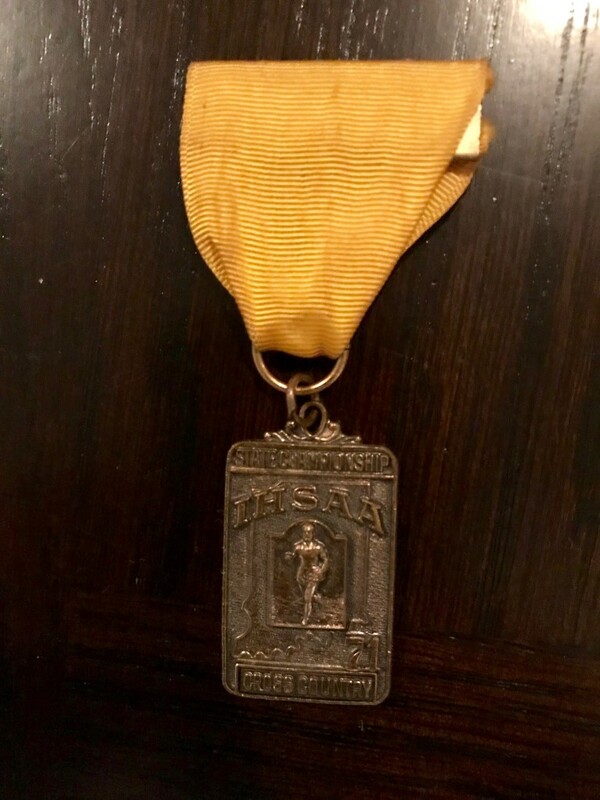 During the 70s and 80s only the first five team placers at the state meet were awarded trophies/plaques/ribbons at the state meet. The presentations were made on the back of a truck. 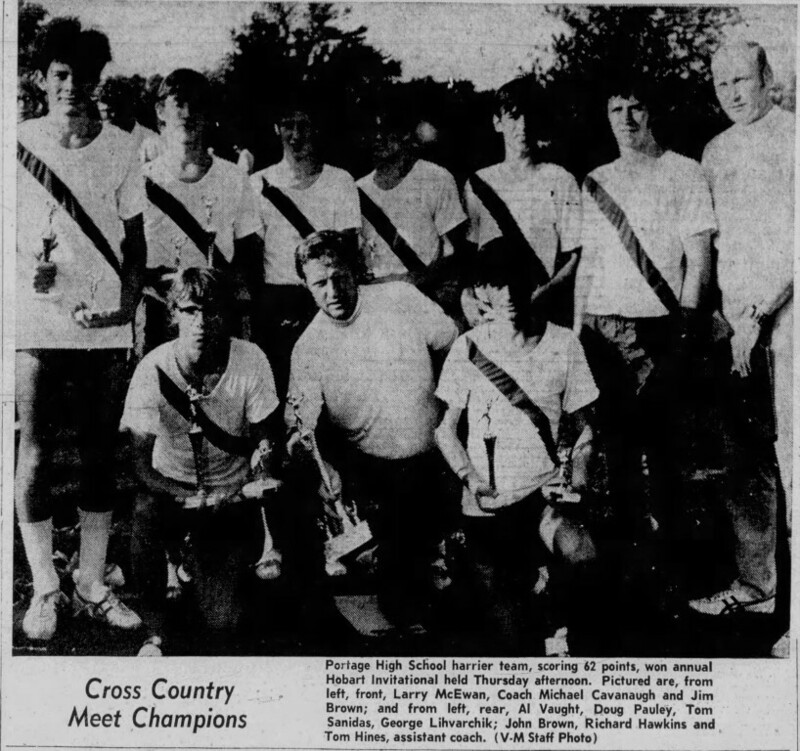 The 1971 season would see the team make the school’s first trip to the truck. The team was a mix of senior runners who had been with Coach Cavanaugh since his arrival and sophomores who had achieved excellence the previous fall, in their first year of high school. The team was undefeated in duals with a 13-0 record. The team brought home first place trophies from the New Prairie, Patriot, Hobart and Laporte Invitationals. 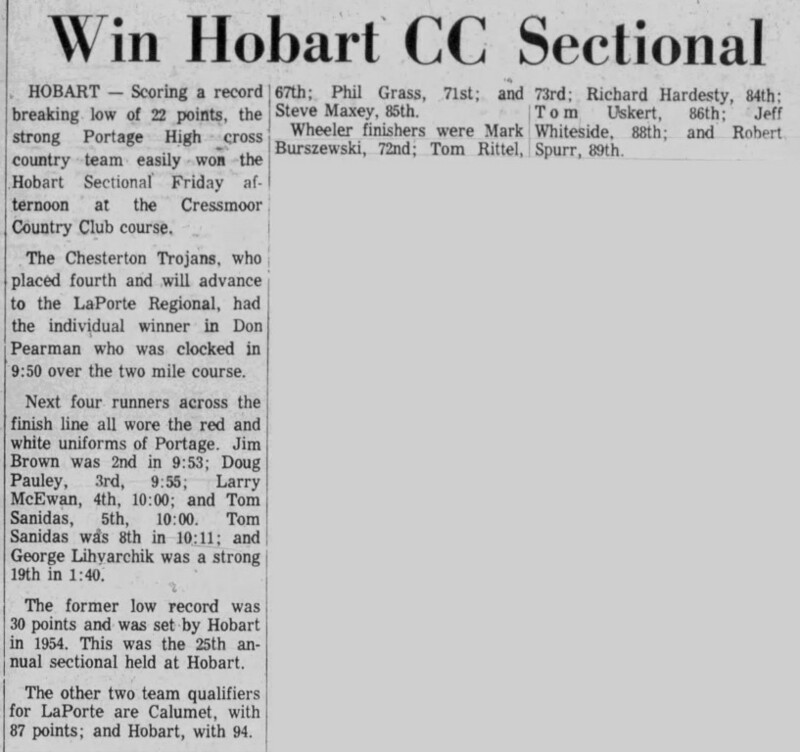 It was the first time the team had won Hobart and Laporte. 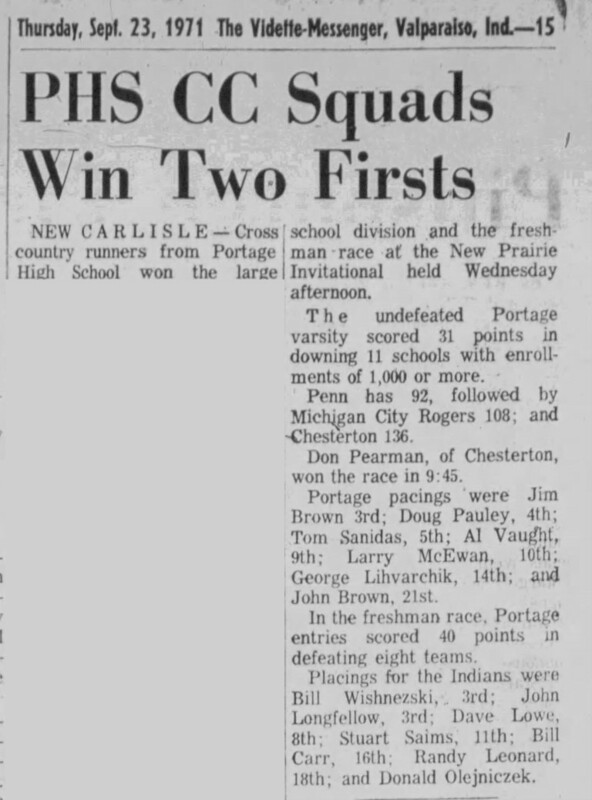 The team also captured the school’s first Duneland Conference title, while also capturing the junior varsity race. 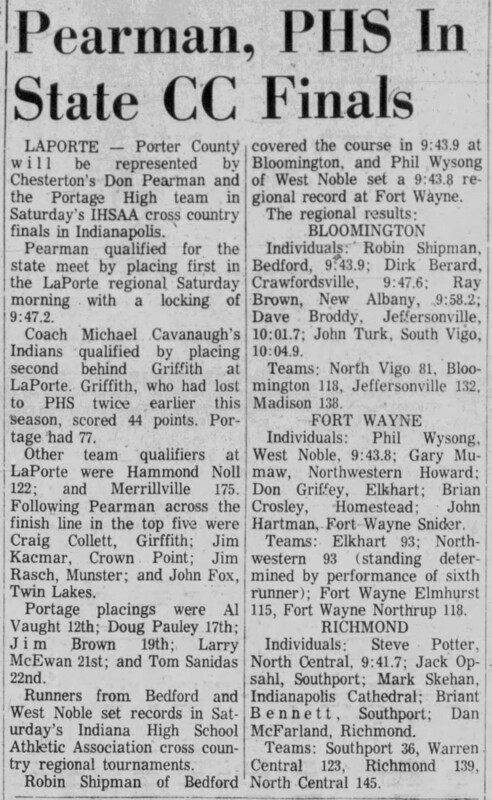 PHS would place all six runners in the first ten places. Quite an achievement. 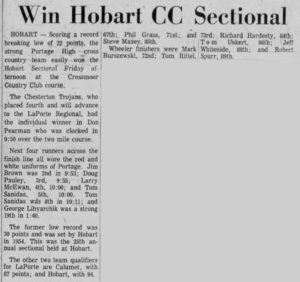 The team captured the school’s first sectional title while at the same time setting a record for scoring with an all-time low score of 22. 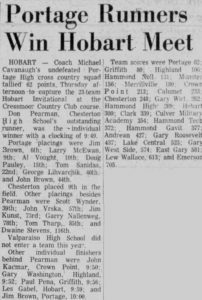 The runners finished 2nd through 5th and 8th. 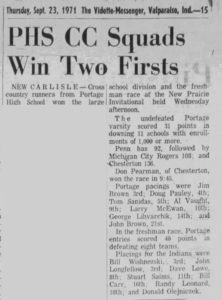 After bringing home the school’s first sectional title, the following week the team finished second at regionals and became the first Portage team to qualify for the state meet in school history. The following weekend the team would place 4th and earn their first trip to the truck. It was a successful season for Coach Cavanaugh and his team. Seniors Jim Brown, George Livarchak, Doug Pauley, Al Vaught and Richard Hawkins, finished their careers with a sterling season and set the bar for future classes to achieve. 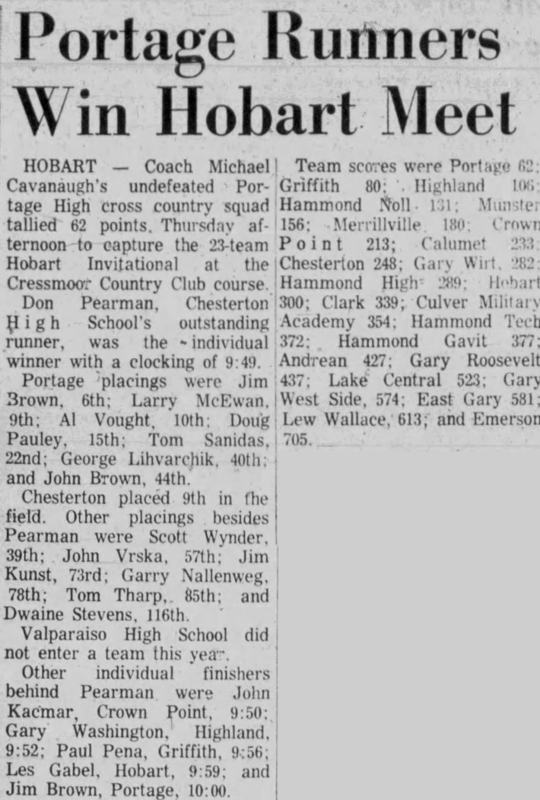 They had been 9th graders in Cavanaugh’s first season in the fall of 1968. Pauley and Brown were named MVP for the squad and also earned their 3rd letters. Vaught was named team captain. 4th place was a great result for a team that had never made it out of regionals. In the spring the track team captured 1st in the Duneland Conference meet. Second in a row.